Meaning Average revenue is the revenue per unit of the commodity sold. It is found by dividing total revenue by the number of units sold. But since different units of a commodity are sold at the same price, in the market. average revenue equals price at which the commodity is sold. Thus, as (lrin. 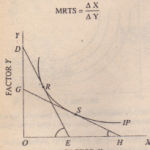 Since the consumer’s demand curve is a graphic relation between price and the amount demanded. it also represents the average revenue or price at which the variou amounts of a commodity are sold. because the price offered by the buyer is the revenue from seller’s point of view. Therefore is really the same thing us demand curve oCthc consumer. On the other hand, marginal revenue at any level of firm’s output is the net revenue earned by selling another (additional) unit of the product. 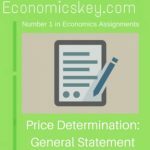 Algebraically, it is the addition to the total revenue earned by selling ‘n’ units of product instead of no where n is any given number. The word net in this definition is important. If the price of a product falls when more of it is offered for sale then that would involve a loss on the previous units which were sold at a higher price before ami will now be sold at the reduced price along-with the additional one. This loss in the previous units must be deducted from the revenue earned by the additional unit. Suppose a finn is selling 7 units of the output at the price of Rs. 16 per unit. Now if it wants to sell 8 units instead of 7 and thereby the price of Ihe product falls to Rs. 15 per unit, then the marginal revenue will not be equal 10 Rs. 15 at which the eighth unit is sold. Seven units, which were sold at the price of Rs. 16 before, will now all have to be sold at the reduced price of Rs. 15 and that will mean the loss of one rupee on each of the previous 7 units. The total loss on the previous units would be equal to Rs. 7. Therefore, this loss of 7 rupees should be deducted from the price of Rs. 15 of the eighth unit while reckoning the marginal revenue. The marginal revenue in this case, therefore, will be Rs. 15- Rs. 7 = Rs. 8 and not Rs. 15 which is the average revenue. 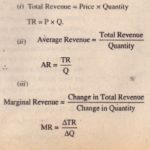 The marginal revenue can also be directly found by taking out the difference between the total revenues before and after selling the additional unit as follows: Total revenue when 7 units are sold at the priee of Rs.16=7x 16=Rs.112 Total revenue when 8 units are sold at the price of Rs.15=8x 15=Rs.120 Therefore. Marginal Revenue or the net revenue earned by the 8tJl unit = 120 – 112 = Rs. 8 Thus, Marginal Revenue of the nth unit. = difference in total revenue in increasing the sale.